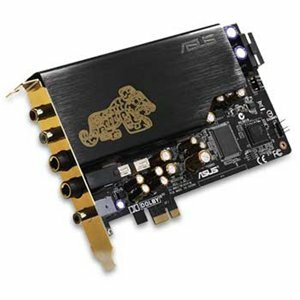 Introducing the Asus Xonar STX Essence Soundcard..... 124 dB SNR / Headphone Amp card for Audiophiles! Thousands of years ago, our ancestors crystallized their knowledge of the materials and music into the Chime of Tiger, one of the first audio masterpiece in human history. Gold-plated on the EMI shield, the Chime of Tiger totem not only represents Asus Xonar team’s new footnote in audio innovation, but also mankind's endless pursuit of the Essence of Sound. Choosing only the best components and finest design, Asus Xonar Essence STX achieves unprecedented 124 dB SNR – 64 times clear than on-board solutions, bringing top-o-the shelf audio experience for audiophiles. A high-quality TI TPA6120A2 headphone driver supports headphones up to 600ohms of impendence with lower than 0.001% distortion. Drive your headphones as intended without additional amplification. This exclusive ASUS technique utilizes multi-layer PCB design to separate signal and noise, ensuring only the cleanest signals are passed to sensitive components. EMI and shielding seals all analog output signals perfectly from noise, offering distortion-free audio enjoyment. Using state-of-the-art etching technology, Nichicon "Fine Gold" capacitors deliver rich bass and crystal-clear high frequencies. Tune up your unique sound - OPAMP sockets allow simple, solder-less alteration for user-preferred sound color.